Who Owns What In America? Imagine lining up everyone in America according to what they own, starting with those who own nothing and continuing down the line to those who own a lot. Now divide that line of people into five equally long segments. Each segment would include 20% of the total population, or about 61.7 million people. Next, add up the total amount of what everyone owns in each segment. The result is represented by the pie chart below. The whole pie represents the total wealth in America. The size of each slice represent the ratio of how much each segment owns of America’s wealth. The slice of ownership for the poor and working poor are barely visible. 80% of all Americans own just 15.6% of America’s wealth. The number of people who slipped into poverty in 2010 is an all time high of 46.2 million, so the poorest 20% in terms of wealth ownership includes 15.5 million folks who technically don’t meet the poverty criteria, based on income levels. The poor essentially own almost nothing. The working poor own twice of almost nothing. 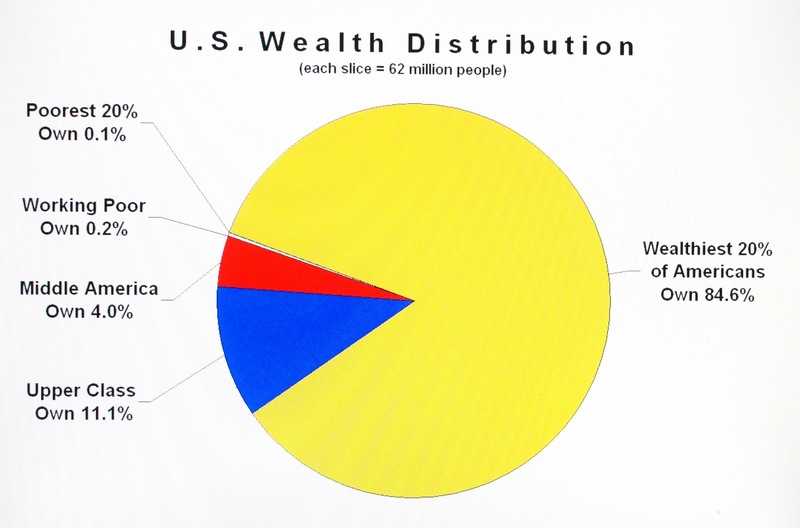 When I first plotted the distribution of wealth in America in this pie chart it reminded me a little of that Pac-Man character. The richest Americans own 84.6% of everything while the remaining 80% of us have 15.4% left. The statistical middle of what I labeled the “Middle America” owns just 4% of America’s wealth assets. This raises an interest question. How do we define middle class? Is Middle America, as I’ve labeled it here the same as middle-class? No, We usually define middle class by income levels, not wealth ownership. As of 2011 the median family income has declined to just over $51,000 per year. If we were to define middle class based on 10% of families above and below the median income (as I have done here for wealth ownership, the narrow and very low income range would not fit most peoples conception of “middle class”. But this pie chart displays the distribution of wealth, not income. It includes all equity ownership in everything from homes to 401K’s, stocks, bonds, businesses, etc. This chart cannot be directly converted to income levels. There are people with equity but not much income and people with large incomes but not much equity. This graphic really make clear just how compressed wealth distribution is in America. Missing from the public dialogue over the past few decades is mention of the working poor. Politicians and the media seem to focus on the middle class or the poor as if there were no working poor. The other conclusion I come away with is that there is plenty of wealth here in the still wealthiest nation on Earth. Telling ourselves that we can’t afford social services for the poor or good public schools or what ever else we desire as a nation is simply not true. As a nation we can afford a much better society than we have now. By Brian in Economy on December 2, 2012 . A good visual depiction of how we distribute the wealth in America. I have to thank you again for re-blogging my post. So many more people got to see it which is a good thing for better understanding our society and the masses of poor people who go unnoticed in the media. The “distribution of wealth”? Why do we not recognize those who have worked hard to get to where they are? If the case is that they have stepped on others to get to where they are (and we know that this is not the case with every wealthy person in America, and to think otherwise is ludicrous) who’s fault is that? If the person stepped on is not aware is that the fault of the one stepping on them? Grow up! Wise up! Keep a sharp eye so no one takes advantage of you. I say that if a person has legally and ethically gained wealth (notice that it is that they have done this rather than it being distributed to them which is fallacious) it is a great thing. After all, these are the men and women who give others a chance to gain employment to take care of their families and others. As far as the working poor and the poor, we will always have the poor with us. There is nothing that can be done about those who choose to live in poverty. That is not to say that everyone who is poor chooses to live in poverty. But here in America everyone who is a citizen has the same opportunity as anyone who is wealthy to make a life for themselves. I had nothing when I started my first business in high school. I ended up selling it. My second business took more capital than I had but it was successful and I was able to get out of debt from it. My third business started with a bank loan and I used a friend’s truck for collateral. I sold it eight years ago and didn’t make profit from it, but I made money while I had it. Wealth distribution is poppycock if I’ve ever heard the term! Let’s talk about “dissemination” because that’s what you’re really talking about. And to put it frankly, dissemination is going to be the death of more businesses which means higher interest rates and inflation and jobless rates. Most wealth is inherited, not earned. Great fortunes are invested, their owners contributing capital but no sweat equity, no brilliant innovations and no heroic effort to grow their shares. There are exceptions, of course, and these folks are trotted out over and over again to leave the impression that every great fortune is earned by hard work. Over 90% of the income from our wealthiest citizens is from investment income for which they are taxed at half the income tax rate of those who work a 40 hour week. Great wealth equals great power and the wealthiest use their influence to continually tilt the playing field in their favor. When people talk about redistributing wealth most people, including you, think in terms of taxing the wealthy. Did you know that the original progressive income tax as first enacted in 1913 was designed to tax only the wealthy? (1) In inflation adjusted dollars, anyone originally making less than $100,000 per year paid no income taxes and those who did pay lined up to do so. It was the patriotic thing to do. It was due to bracket creep, the failure to index the tax code to inflation, that brought income taxes to the working class. Up until the Eisenhower administration the top tax bracket for wealthy American’s was 90%. It was 70% when Ronald Reagan took office. He reduced it to 28%. (Now it is back up to 39%). But when I think about the distribution or redistribution of wealth it first brings to mind wages, not taxes. Wages are the front end of wealth distribution. If riches were fairly distributed in the first place there would be less need to talk about RE-distribution. US Wages have been frozen relative to GDP for over 30 years. (2) This was a conscious plan by the wealthy and influential beginning back in the late 1970’s. The huge piles of wealth generated by rising GDP since then have been distributed to the wealthiest Americas. CEO’s in Europe work just as hard yet are compensated with 1/10th of what their American counterparts get. And if you are logical about it, how is it even possible for a CEO to work a half a million times harder than their janitors? Thanks for the time you took to expand your explanation. I will certainly read the information in your response. However, if shareholders of companies are willing to pay a CEO to give his company a minimal amount of time for millions of dollars, it’s the decision that they make. The only people that seem to complain about such wages are those who don’t have them! It appears that the majority of this rhetoric is pure envy. Again, thanks for your time. I’ll check out these two links you listed. I appreciate that you are considering my words with an open mind. This is rare these days. I hope you will see that envy may be too harsh a judgment for a parent working full-time but still unable to shelter his family or meet their medical needs without public assistance. Envy is one of the seven deadly sins, but so is greed. Which of these you might apply here depends on how you choose to define distributive Justice. I see you are Christian. The Bible has very clear views on distributive justice that are often at odds with prevailing wisdom today. If you read what I have written in a biblical light you might come to see what I see. I will do what you have suggested. Thanks again. This is informative and is helping me to understand more clearly what’s happening in our Country. Now I agree that wealth gained legally and ethically is a great thing. But the game is clearly tilted in the direction of the wealthy. Their income is taxed at lower rates and they don’t pay payroll taxes on most of their income. Also the wealthy have a jump start over other Americans. They can afford better education, they can start without debt from college. They start will a leg up on everybody else. Now I am not saying that other people don’t have a chance. I am simply saying that the wealthy have a greater chance than the rest of us. I don’t think redistribution of wealth is what we need exactly. But we need to address wealth inequality. Yes there will always be wealth inequality but America is getting extreme and it will continue to cause problems. Many Americans can look at the news and see that the stock market is at a all time high. They can see that corporate profits are doing very well. They can see that the incomes of the wealthiest have risen dramatically over the past 30 years. Yet even though business and the wealthy have done well the bottom is no better off. Wages have stagnated. Unemployment is still very high. Prices continue to rise. This is a problem. Our economy is getting top heavy. Think about what drives business? Consumption. What drives consumption? Consumers. What drives consumer’s habits? Wages. What is stagnating? Wages. As the middle class shrinks our power to domestically support business decreases. We can’t consume luxuries if we can’t pay our bills. The majority of business can’t be sustained by the wealthy, there simply isn’t enough of them numerically to consume like a middle class does. Thus as the middle class shrinks and the wealthy grow they hurt the country’s ability to make wealth. What a great point you make … and your final 2 sentences are so true. I think, sometimes, the problem is we let our elected officials divide us by creating 2 different ideas of who we are as a nation. I’m really looking forward to learning from your essays. Thanks for passing on your experiences! Keep them coming! Thanks for taking the time to read my story about Rusty and I’m glad you enjoyed. Thank you very much for re-blogging this post. Reblogged this on Offlogic’s Weblog. The author’s reference to Pac Man is a great way to look at wealth distribution in the United States. The wealthiest few (shown in yellow) are running around gobbling up the rest of us. As with most skilled Pac Man players, the Government Ghosties are no trouble at all as they float around unable to limit and control the runaway accretion of wealth in the skilled hands of a few players in the American arcade. This chart is only a part of the picture. As we all know, wealth equals power. It is an avenue to have a voice in the political process. It turns out in this country that you can have as much government as you can buy. So, when wealth aggregates at the top, so does political pressure to assist in that aggregation. Tax rates drop on corporations and on the wealthy, resulting in an even more top-heavy distribution. Estate taxation is minimized (or even disappears entirely) and thus aggregated wealth is passed from generation to generation, giving us an entitled, but not necessarily productive class. This pushes the tax burden onto the less wealthy. To justify this, the wealthy and corporate sectors decry social services and bemoan the “dependent” class. Nowhere in this chart is it noted that American workers are more productive now, than at any time in history. Yet real wages have been dropping since 1973. You are absolute correct. Great wealth is great power and passing this power along as a birthright doesn’t square with democratic ideals. This post is about accumulated wealth, but the other two listed in my prior comment are about the history of wages and the history of taxes. It’s hard to put all of this in one essy, so you might want to look at the other two. Thank you for your comments. There are approximately 311 million Americans in the country. The distribution of wealth across those 311 million is much more inequitable than most think. The fact is that the top 1% of Americans (or a little over 3 million people) own 40% of all wealth in America. The bottom 80% of Americans (or roughly 248 million people) own only 7% of the country’s wealth. The top 1% own 50% of all stocks, bonds, and mutual funds. The bottom 50% (about 155 million people) own only .5% (thats right, 1/2 of 1 percent) of stocks, bonds, and mutual funds. have angular cheilitis is if you have cracks in the corners your mouth along with redness, swelling and tenderness in the area.